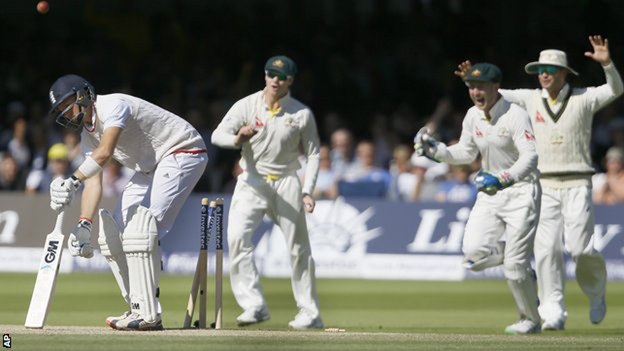 England slumped to a catastrophic defeat by 405 runs at Lord's as Australia levelled the Ashes series at 1-1. The hosts collapsed after lunch on the fourth day and were bundled out for 103 in just 37 overs, with Mitchell Johnson taking 3-27. Australia had earlier reached 254-2 declared in their second innings, leaving England to bat 155 overs to save the game. That they fell so woefully short raises serious questions about the calibre and make-up of a team that only a week ago stunned Australia bywinning the first Test in Cardiff by 169 runs. And after England's top order once again crumbled, the selectors will surely ponder changes before the series resumes at Edgbaston on 29 July. For Australia, such a swift and categorical riposte to the defeat in south Wales will bolster their belief that they can pull off their first Ashes win in England since 2001. The relative calm with which Alastair Cook and Adam Lyth negotiated three overs before lunch offered no indication of the pandemonium that was to follow the interval. Lyth, Cook and Gary Ballance were all caught behind, the captain to a particularly frivolous swing away from his body. Ian Bell led a charmed life as he ground out 50 balls for 11 runs before poking forward at Nathan Lyon and popping a catch to short leg. The real nadir arrived when the in-form Ben Stokes threw his wicket away in diabolical circumstances. Running through for a comfortable single, he had made up his ground by the time Johnson's throw shattered the stumps. Crucially, however, Stokes neglected to slide his bat into the crease and was in mid-air when the ball hit, meaning he had to go. The tea interval ostensibly gave England a chance to gather their thoughts and steel themselves for a plucky fight to the close. In the space of five balls from Johnson, five wickets had become seven as Jos Buttler nicked behind before Moeen Ali flinched at a bouncer and looped a catch off the splice to short leg. Broad briefly flung the bat to collect five boundaries but when he chipped Lyon to cover, England were 101-8. Only two further runs were added before Josh Hazlewood bowled Joe Root and James Anderson in successive overs to send Australia into raptures. England's frenzied showing on a placid pitch contrasted with the serenity of Australia's performance in the morning session as they added 146 runs to set England a notional 509 to win. David Warner made 83 and Steve Smith 58 after Chris Rogers had been forced to retire on 49. The left-handed opener, 37, suffered a sudden dizzy spell and was escorted to the dressing room, where he rested for the remainder of the match. 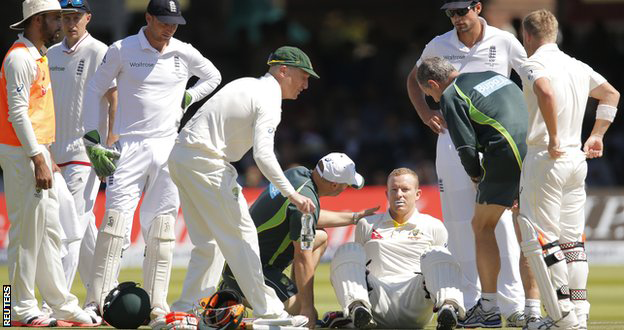 Rogers missed two Tests in West Indies in June and was struck on the head by Anderson on the morning of the second day. England captain Alastair Cook: "When you get bowled out for 100, it isn't good enough. Australia put us under pressure and we weren't able to deal with it. "We came up short this week. We have to take this on the chin. Now it's about the character we need to show to bounce back." Australia captain Michael Clarke: "I couldn't have asked for a better performance. "We didn't play our best at Cardiff, but now we can look in the mirror and say we played some good cricket here."